The “Cheesegrater”, the tallest building in the City of London, has been sold to a Chinese property tycoon for £1.15bn, the second-biggest ever sale of a UK building. The developer behind the 224 metre tower, British Land, and its joint venture partner Oxford Properties, the global property arm of a Canadian pension fund, have sold the landmark building to CC Land, a Hong Kong-listed company controlled by Cheung Chung-kiu. The deal is the biggest sale of a single building in the UK since 2014, when the HSBC tower in Canary Wharf was sold to Qatar’s sovereign wealth fund for £1.18bn. It is also one of the biggest Chinese purchases of UK property. The sale suggests investor interest in UK property remains strong, despite Britain’s vote to leave the EU last summer. The weak pound has drawn in global investors, despite uncertainty created by the referendum. Officially called the Leadenhall Building, after its location, the tower was completed in 2014 after a four-year construction period and broke records for rents in the City. It is fully let to a number of financial firms, including insurers Aon and MS Amlin. Designed by Rogers Stirk Harbour + Partners, the Cheesegrater got its nickname from its distinctive wedge-like shape, created to preserve views of St Paul’s Cathedral. It drew ridicule when three bolts snapped only months after it was completed, forcing British Land to cordon off an area below the tower. It is one of a series of skyscrapers that have sprung up in the Square Mile in recent years, such as the “Walkie Talkie”. They will be overshadowed by the planned 304.9m Trellis tower at 1 Undershaft, which will be almost as high as the Shard – the tallest building in western Europe. 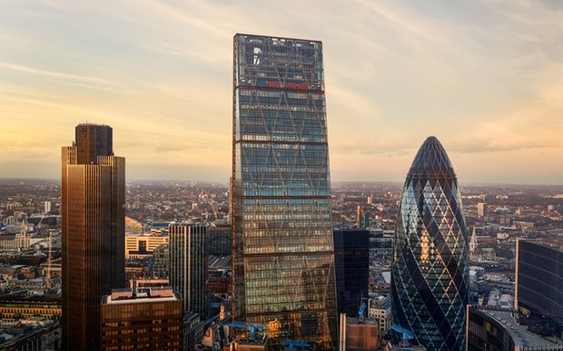 Tim Roberts, head of offices and residential at British Land, said: “British Land and Oxford Properties took a bold step at the early stages of the UK’s economic recovery to develop the Leadenhall Building to generate a high-quality, long-term income stream. It’s a decision which has really paid off. Contracts have been exchanged but the deal still has to be approved by shareholders of CC Land.